Embracing Orchard Road’s heritage as one of the original Straits Chinese enclaves in Singapore (circa 1800s), The Peranakan Gallery brings to life a rich tapestry of traditions that were once prevalent in the district — long before Orchard Road gained fame as the island’s most-visited tourist destination. This newly-launched Place of Interest is a must-visit experience depicting the timeline and evolution of Straits Chinese culture in Singapore and South East Asia. Visually immersive and enriching, The Peranakan Gallery promises to be the Orchard precinct’s eminent ode to authentic Peranakan culture. Tag #theperanakansg on FB and IG! are available, kindly contact us for details. The Peranakan Gallery’s main exhibit centers around an elaborate 20-seater Tok Panjang table set with exquisitely-crafted Nyonya ceramics, Chinese porcelain and Waterford crystalware; a nod to the Malay, Mandarin and European influences beloved by the Peranakans and assimilated into their aesthetic. 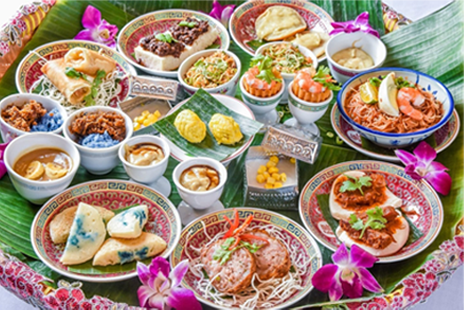 Tok Panjang is a grand spread of dishes laid out with great care upon a table, in celebration of special occasions such as weddings, anniversaries and hallmark birthdays. 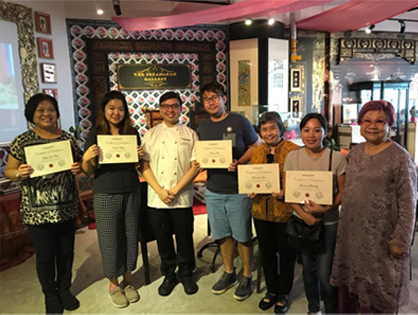 Centering this table at the heart of The Peranakan Gallery spotlights the importance that Babas (men) and Nyonyas (women) place on their distinct culinary heritage. Visitors will be heartened to know that this Tok Panjang table isn’t merely a museum display, as the gallery’s adjoining restaurant, The Peranakan, is able to serve up an authentic Tok Panjang feast comprising over 12 signature items at the table, priced from S$68++ per person (minimum of 8 persons, pre-booking is required). Ideal for corporate entertainment, weddings and intimate dinners. Engage a private Peranakan band to spice up the occassion or private butler/cocktail bar service. 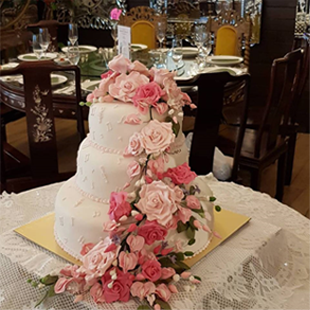 Whatever suits your fancy, call us today at 6262 4428 or emailfriends@theperanakan.com. The Baba Nyonya, known as Peranakan Chinese or Peranakan is a culturally syncretic minority group dating back to the 17th century. They are descendants from the union of earlier Chinese traders from Fujian Province in China with local women of Malay origin. They settled and raised families in the bustling ports of Malacca, Singapore and Penang, known as the Straits Settlement under the British colony. By the late 19th century, their mostly English-educated sons formed an influential class of businessmen, a colonial elite community that pioneered in early Malayan economy and politics. Their negotiation of multiple identities, through the acculturation and adoption of local and European coloniser cultures, gave birth to their eclectic material culture, customs and practices evident in Chinese, Malay, Dutch, British and Portuguese influences. Due to geographic distance, Singapore and Malacca share similar cultural expressions. One example is the Baba Malay, which is predominantly a Malay language with a mixture of Hokkien (Chinese dialect) words, is spoken in the domestic setting. Many family lineages can also be found between Malacca and Singapore. In Penang, the Baba Nyonya community there speaks the Penang Hokkien (a derivative of Hokkien). Although culturally Penang Peranakan Chinese share similar expressions with Singapore and Malacca, the are also similarities with the Peranakan community in Phuket, Thailand (due to geographic distance and people migrantions in the past). Apart from the Straits Settlement, the community can also be found in areas in Indoensia such as Tangerang, Semarang and Makarssar. In the present, there are now diasporic Peranakan communities in Sydney, and Perth, Australia. Historical timeline of events that directly and indirectly impacted and influenced the Baba Nyonya in Singapore, Malacca and Penang. 1511 – Portuguese invasion of Malacca. 1641 – Dutch Colonisation over Malacca. 1786 – Penang island was acquired by British East India Company. 1826 – the Straits Settlement was formed. 1819 – Singapore was acquired by Sir Stamford Raffles. 1942 – Japanese Occupation over Malaya. 1957 – Independence of Malaya. to describe the communitynand these terms are used at different periods of time. In the present, the terms ‘baba’, ‘baba nyonya’, ‘Peranakan’ or ‘Peranakan Chinese’ are used interchangeably to refer to the community. Separately, the term ‘baba’ is used to describe the male member of the community and the term ‘nyonya’ is to describe the female member of the community. These terms are also used as an honorific prefix to a Baba name, such as Baba Ong Kim Koon and Nyonya Lim Chye Neo. The term ‘Peranakan’ is derived from the Malay root word ‘anak’ (child). The term is used as an ethnic label to refer to the descendant of the immigrants who married the locals and these descendants speak in the language of the local people and are acculturated by them. 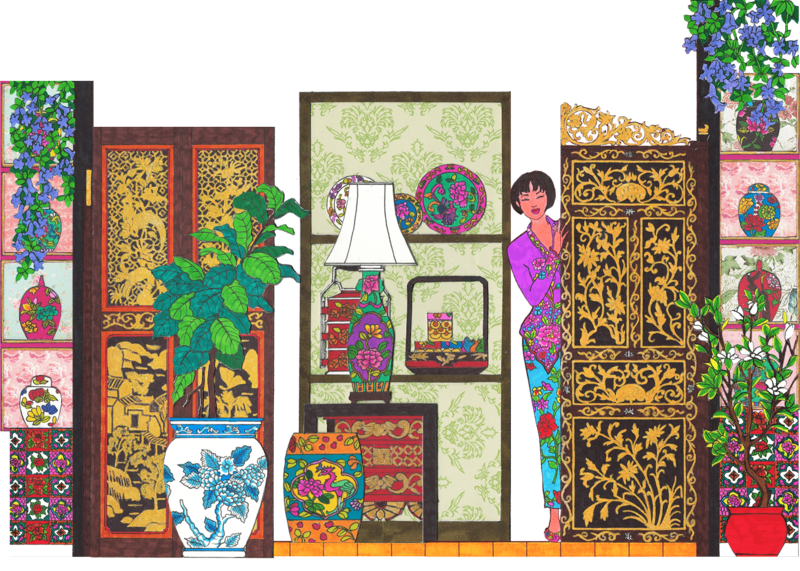 However, it has become common that the term ‘Peranakan’ is specifically refered to the Baba Nyonya community. Other terms such as ‘Straits Chinese’ or ‘straits-born Chinese’ is also used interchangeably to describe the community because it refers to those born in the Straits Settlements during the time of the British colonisation. The term was used to imply permanent settlement and self-ascription that distinguished the social classes of the immigrant Chinese and the Babas before the independence of Malaya. However, after the independence of Malaya, these terms were slowly abandoned, only surfacing when referring to period material culture. Copyright © 2019 The Peranakan Gallery - Singapore. All rights reserved.